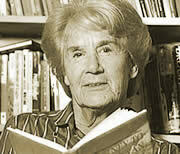 Born in New Zealand in 1910, Elizabeth Riddell was recruited as a journalist straight from school. In 1939 she started work on The Sun newspaper, during World War Two she opened and ran the Daily Mirror's New York bureau, and in the 1960s, she became senior interviewer and critic for the arts pages of The Australian. Several books of her poetry have been published over the years. She was interviewed for Film Australia's Australian Biography series in 1992.